Trieu Phong, Quang Tri (1 July 2016) – It has become a weekly routine. On Thursday RENEW teams conducted another controlled demolition of unexploded ordnance at the central demolition site in Linh An Village of Trieu Trach Commune. 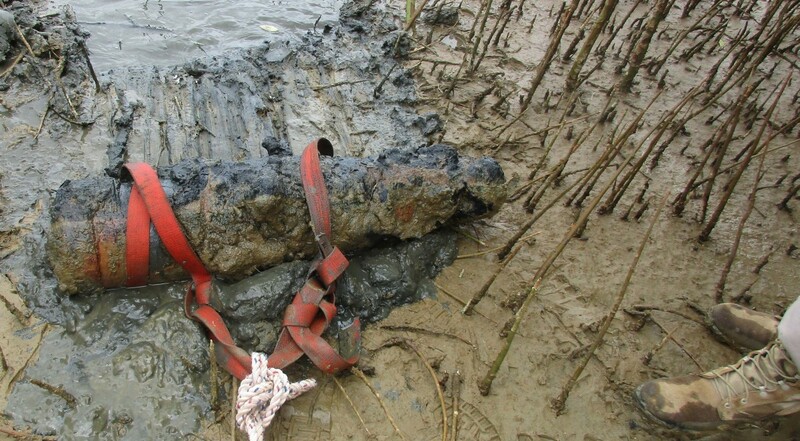 Among the six items of deadly weapons safely destroyed that day was an 8-inch naval shell removed from the Ben Hai River, the former demarcation line that divided Vietnam into north and south during the war. Local fishermen in Xuan Hoa Village of Trung Hai Commune, Gio Linh District had encountered the shell while fishing in the Ben Hai River. They immediately reported their discovery to RENEW’s Community Support Team (CST) who were conducting a non-technical survey of the village. 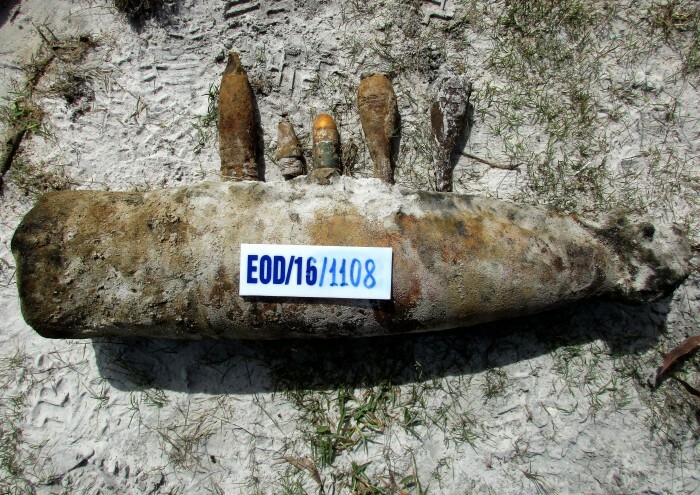 Following local people’s directions, CST team members found a U.S. Navy shell submerged in the waters about 10 meters from the shore. The shell may have been fired from one of the U.S. destroyers deployed along the coast of Quang Tri that bombarded the province during the war. This one was only visible and accessible at low tide. CST team members passed their finding to EOD Team No. 4 and waited for them to arrive. National Technical Officer Bui Trong Hong, a highly experienced retired military officer who is now RENEW’s senior technical expert, arrived at the site to provide assessment and backup. Under Team Leader Truong Vinh’s direction, his four team members waded into the shallow river, reached the embedded shell, and began their careful task of digging it out. After an hour of hard work, the EOD team managed to haul the shell onto the shore. After a much needed rest break, they loaded the shell into the soft sand bed of a pickup truck and transported it to the central demolition site for later destruction. On Thursday at the Linh An demolition site, the naval shell was safely destroyed in a low-order demolition conducted by National Technical Officer Hong and members of EOD Team No. 4. 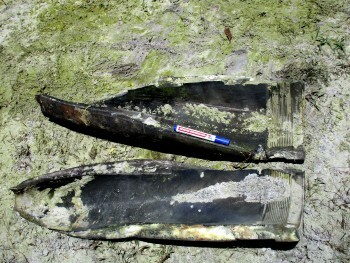 It is not unusual for local people to encounter unexploded ordnance, particularly naval shells, in the rivers of Quang Tri Province. After lying in the water for more than 40 years, some of these deadly weapons are still in surprisingly good condition and capable of creating deadly havoc if disturbed. That’s why it is important for local people to remain constant alert, so they can provide timely and life-saving information and RENEW teams can respond quickly and safely to these threats. During the first six months of 2016, Project RENEW’s Explosive Ordnance Disposal (EOD) teams conducted 850 tasks in response to UXO discoveries reported by local people in Quang Tri Province, resulting in 3,018 items of UXO being safely destroyed. Project RENEW’s UXO Survey and Clearance Program is funded by the U.S. Department of State through primary partner Norwegian People’s Aid (NPA).